:59pm, March 3, 2010. Playing SEGA & Sonic All-Stars Racing. The game goes through a period of 3-5 seconds of strange video lag, then the screen goes blank. Not a power outage. TV still works. Receiver still works. Power strip is on. No lightning to blame. The only remaining component . . . the 360. I purchased my 360 during the Halo 3 launch. It's a Collector's Edition; green with copper accents, like Master Chief's armor, and UNSC branding. I adore it, but there's been this nagging feeling in the back of my head for a while now that death was near. A few spots of lag during Rock Band were the earliest symptoms, but those were far between. Black TV screen, blank except for the words "No Signal," hovering in the top left corner. 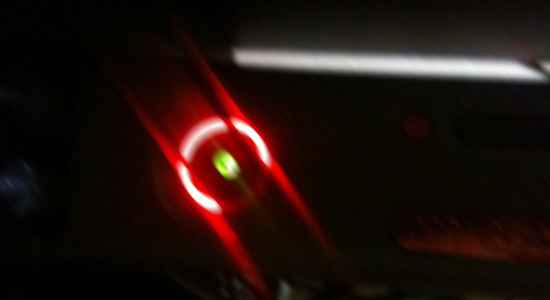 Then one day I suffered a mild heart attack when my 360 showed two red lights (three being the dreaded Red Ring of Death). This turned out to be overheating, and a can of Dust-Off later the problem was solved. Since then, though, the lag had returned, just often enough to strip me of my confidence and mildly annoy everyone during my weekly Rock Band party. I want to find a giant rat behind my A/V cabinet, chewing through my cables like a Mynock. But there is no rat.I check the cable connections going to the back of the 360. I want to find loose cables. I want to find a giant rat behind my A/V cabinet, chewing through my cables like a Mynock. The connections are snug. My power brick is warm. There is no rat. A friend of mine lost his 360 a few months ago. A coworker has gone through two of them. Mysteriously, I have been issue-free. I've always had good luck with electronics; I've never had a data loss, hard drive failure, kernel panic, or any other horror-story moments that weren't my fault. I accidentally deleted my iTunes library one time, but that only cost me dozens of hours of time spent burning the CDs again. I've never had a catastrophic system meltdown like most of my friends have. I think about my good fortune as a stand in the middle of my living room, staring at my 360. I take a step forward to turn it on, hesitate, and take a step back. I'm scared. I don't want to turn it on. What if I don't hear that familiar wooooooooooosh-zzschwong sound coming from my speakers? What if the lights aren't green? What if the lights don't come on at all? I call my friend Justin. "I've had three of them. Three Red Rings. Those things are like ticking time bombs. Why, did yours finally crap out?" " . . . Maybe. I dunno. I'll call you back." I hang up the phone. Another step forward, another step back. My 360 has become an indispensable part of my home theater. My Denon DVD player sits neglected and jealous, its remote gathering dust on my desk, while my pile of 360 accessories gets bigger and bigger. Headsets. Controllers. Plastic instruments. More plastic instruments. Twitter. Facebook. Netflix. My living room without my 360 is about as useful as a computer with no Internet. I honestly wouldn't know what to do. I swing the glass door to the A/V cabinet aside. I reseat the Collector's Edition copper HD into the top of the 360 just to make sure. Check the connections again. Still no rat. Another deep breath, and then I push the button. I feel and hear the same soft click I always do when I turn the 360 on. The lights, however, are red. "How many lights do you see?!" I feel your pain. I also have the Halo 3 Collectors Edition launch console. It red ringed on me recently. But I was able to send it back & they fixed it for free. So far no problems. There is still light at the end of the tunnel. Though I feel I am only playing on borrowed time from this moment on. My condolences. I've been lucky to not be faced with the 'red ring of death' thus far, and I hope I'm able to maintain that luck. My second, exorcised Xbox hasn't shown any signs of failure for, what, two years now? I fear that can only be explained by lower activity. Currently on my third xbox. My second Elite model. These things get pricey to replace. Fortunately, mine was under warranty. Though, they sent me a replacement instead. And a card for a free month of Live that I didn't notice until a week after I got the console back. Well, at least you got this wonderful post out of it... silver lining, I guess.